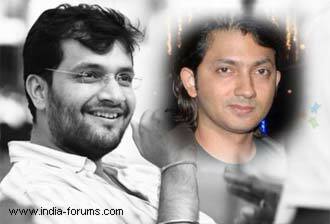 Editor-turned-filmmaker Shirish Kunder says he is happy about the positive reactions for "Agneepath(2012)" director Karan Malhotra, who was his assistant on his debut directorial "Jaan E Mann". "Hearing a lot of nice things about 'Agneepath'. Proud of the director Karan Malhotra. He was my assistant on 'Jaan E Mann'," Kunder posted on his Twitter page. "Jaan E Mann", a 2006 movie, starred Salman Khan, Akshay Kumar and Preity Zinta in the lead roles. Malhotra was the first assistant director for the movie. Malhotra's directorial debut "Agneepath", a remake of the 1990 movie of the same name, released Thursday. With Hrithik Roshan, Sanjay Dutt and Priyanka Chopra in key roles, the film has received a thumbs up from industry members. Actor Karanvir Bohra is torn between his small screen and big screen commitments. On one hand he is busy with the shoot of an upcoming movie, and most of the times he is busy with Life OK's show "Saubhagyavati Bhava". In the show, produced by UTV Television, he plays an obsessive and abusive husband. On an average, his day starts with shooting for the show at Film City and continues till late night, post which he often rushes to the set of his upcoming film, details of which are currently under wraps. If sources are to be believed, his schedule is so tight that sometimes he doesn't go home at all. Instead, he reaches the sets early and catches a quick nap to avoid any delay in the schedule. What's on Anirudh Ravichander's playlist? He has made the nation groove to "Kolaveri di", but one wonders what 21-year-old composer Anirudh Ravichander likes to listen to in his free time. "I listen to all kinds of music, I normally go through phases when it comes to listening to music. Like right now, I listen to a lot of house and dubstep (a genre of electronic dance music)," Ravichander told IANS. He recently composed the soundtrack of Tamil film "3".